A woman sorts rice grains in a paddy outside of Ubud, Bali. Rice is much more than a staple in Bali. 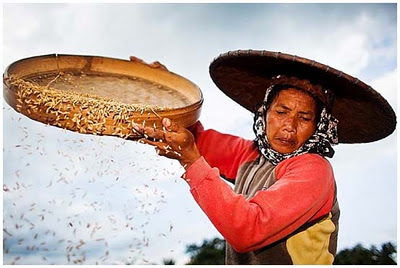 A huge part of Balinese Hindu culture is built around the cultivation is rice. In Bali, Rice is Life. There are more photos of Balinese rice farmers in my PhotoShelter archive and available from ZUMA Press.